The December 2017 edition of imPULSE, the Commission’s quarterly newsletter, can be read online. This issue includes resumes of the latest awardees’ heroic acts, as well as updates on several awardees and their legacies. Two towns came together to honor their heroes — representatives of Knoxville, Tenn., led by a local teacher recently named a bridge after Mary Frances Housley and folks from the Aquashicola (Pa.) Volunteer Fire Company and Palmerton Area Historical Society requested a grave marker for the headstone of John N. Miller and planned a memorial ceremony to unveil it. 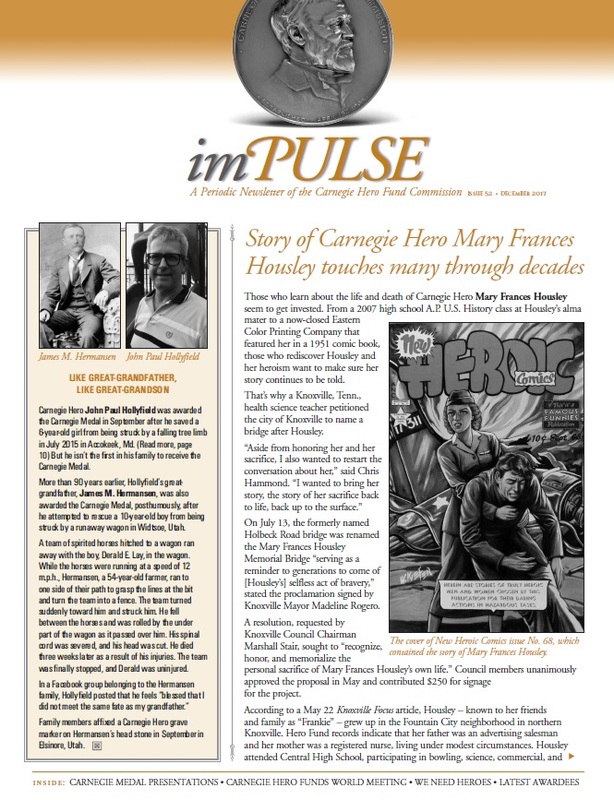 In addition, Carnegie Hero Charles S. Harris recently released his third book and Earl Francis Higgins continues to be remembered by his fiancée, Nancy J. Rig, who became involved in a swiftwater rescue organization after Higgins drowned while aiding a boy who fell into the Los Angeles River. Kentucky Gov. Matt Bevin presented the Carnegie Medal to the family of Lori Doppelheuer Kearney and Louis Daniel Scharold at the Kentucky State Capitol building. The wife of the late Kenneth R. Atkinson was awarded his medal by Centennial (Colo.) Mayor Cathy Noon, Arapahoe County (Colo.) Sheriff David C. Walcher, and Councilman Mark Gotto at a council meeting in Centennial. Jason Barnes received the Carnegie Medal from U.S. Rep. Jamie Raskin, who represents Maryland’s eighth district. Carnegie Heroes Gary J. Messina, David Blauzvern, and John J. Green III attended the Carnegie Hero World Funds meeting held in New York City, where Hero Fund Board Chair Mark Laskow presented each of them with the medal. Nebraska Gov. Pete Ricketts and Omaha Police Capt. Michael McGee presented the Carnegie Medal to Robbie Goering-Jensen, Dennis Wilson, C. Fredric Holbeck, and Brett Bailes for two separate acts occurring in Omaha. Commission President Eric P. Zahren traveled to Kingfield, Maine, to present the posthumously awarded Carnegie Medal of Dennis D. Swenson to Swenson’s sister. John David Smith received the Carnegie Medal from U.S. Rep. Dave Reichert of Washington’s eighth district in Reichert’s district office. California Highway Patrol Capt. Barry Koenig presented Stephanie Melinda Marino her medal at the highway patrol’s office in Stockton, Calif.
Other features include updates on the Medal of Philanthropy and a meeting of the Carnegie Hero World Funds, as well as an essay written by the granddaughter of Carnegie Hero Joseph D’Amato and on the necessity of heroes in our society. If you would like added to the mailing list for e-mailed or hard copies of imPULSE, e-mail us your address at impulse@carnegiehero.org.